So my hair is getting to that stupid can’t-do-anything-with-it length and so I decided I wanted to make myself some cute little covers for it, and I want to crotchet them. Now when it comes to doing a simple crotchet square I’m pretty quick and have a huge pile of squares just waiting to be made into a rug – but I don’t know how to join them all up *sigh* but now I want to make this hat only I don’t know if my failing attempts are even close to correct as the pictures on the website don’t show the top of the hat and I need this to figure out if I’m even close to on the right track *grumble mumble brain fog moan* It calls for DC (double chain) stitches which I have never attempted before and everything I can find on the net so far is showing me how to do them for a straight line and not to create a circle. I thought that LJ might be able to help me out but one community I found has been closed down and the other one for beginners has a moderated joining! Dont’ they realise that newbies join these lists when they have a sudden problem and want answers now! grrrr! 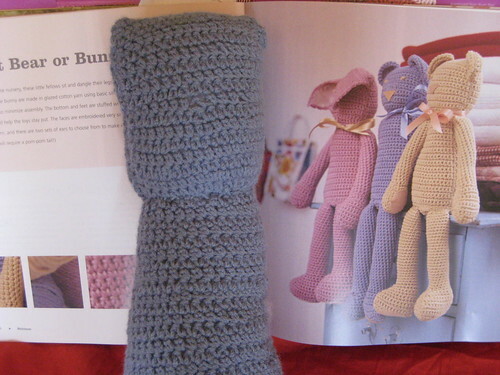 My husbands cousin is due to have her baby soon and I thought I might have a go at crocheting a little gift…. I think I need to do a few more basic things before I try this again. My head has come out a rectangle rather then a square, the body is ok but when I attempted the base and the then the arms I kinda got stuck. My circular bas ended up a bit more like a hexagone and I just can’t get the arm tubes to work. My gauge is soo far off it isn’t funny. I think this one is going on the shelf for a long long while.